The autopilot is easy to install with flexible mounting options and quick, easy commissioning. Choose a corepack with our patented Shadow Drive technology, and simply turn the wheel to take control of the helm; hold a constant course to re-engage. It integrates with compatible Garmin electronics to control the autopilot from the chartplotter display. And it can be engaged to follow an Auto Guidance path³ (requires LakeVü HD Ultra maps or BlueChart g2 Vision HD charts). Compact Reactor 40 can be operated directly from your compatible Garmin chartplotter¹ screen or by using up to 3 GHC helm control units. 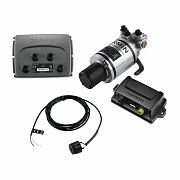 GHC communicates with the autopilot system via your NMEA 2000 network, so autopilot heading data can be shared easily with other devices. This enables MARPA and chart overlay when connected to a Garmin radar and chartplotter. An optional handheld wireless remote control is also available. ¹Not recommended for fishing or applications that require holding heading while trolling or at low speeds. For applications that require precise heading control while trolling or at low speeds, our higher-performance Reactor 40 models are recommended.